These days I'm constantly on the hunt for our future Philadelphia home so naturally, I'm spending a LOT of time stalking Craigslist. I'll be the first to admit that I'm pretty picky when it comes to what I'm looking for, but I'm also more than willing to look past the ugly and/or crazy that you find in Craigslist postings to find that diamond-in-the-rough that might fit our needs perfectly. That being said, I've come across some pretty crazy-looking and straight-up unhelpful ads in my hunt and I'm just so curious what these people were thinking when they put their listings up! 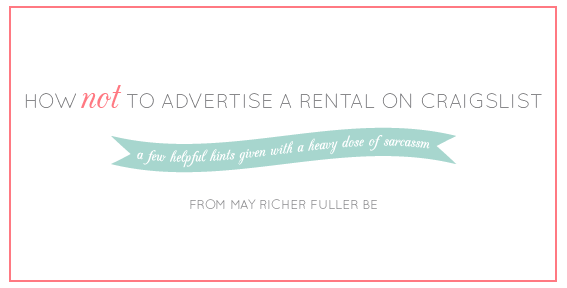 I thought it would be fun to put together a list of a few "suggestions" on what not to do when it comes to advertising rentals on craigslist - complete with a few demonstrative screenshots - if you're actually trying to rent a place out to reasonable humans. ;) Please tell me y'all have experienced some of these things when you've been house hunting on good ole Craigslist! Don't post pictures that make you look like you had too much to drink when you took them. You may think it's artistic, but it's making the rest of us motion sick! Don't not include photos. Nearly every phone has a camera these days, so there's no reason to say, "Sorry, no photos," in an ad. It's not hard to snap a few pics and put them in the post. Many people skip contacting the person about the place if there isn't a single photo. And while you're at it, proofread it before you post. BUT. Don't post a random photo that has nothing to do with the home just so that the little "pic" word shows up next to the post's link in the listings. Flowers aren't going to make me want to see your apartment. Sorry! ALSO. A little mess is ok in photos, but if it looks like a tornado just went through your kitchen, you might not want to use that one. Oh, that's the KITCHEN. I see it now. There's a fridge... and cabinets and a sink...I think? Don't use a crazy string of random symbols in your listing title. I'd rather have some additional information such as "Gorgeous, Pet Friendly Two Bedroom with In-Unit Washer/Dryer," than a string of ##### or %%%% to try and get my attention. And lastly, there's no need for scantily-clad women to grace the beautiful counters of your brand new kitchen. Let those pretty granite countertops and glass-front cabinets speak for themselves! What crazy ads have you come across on Craigslist? P.S. It's day two of the Spring Parade of Homes! 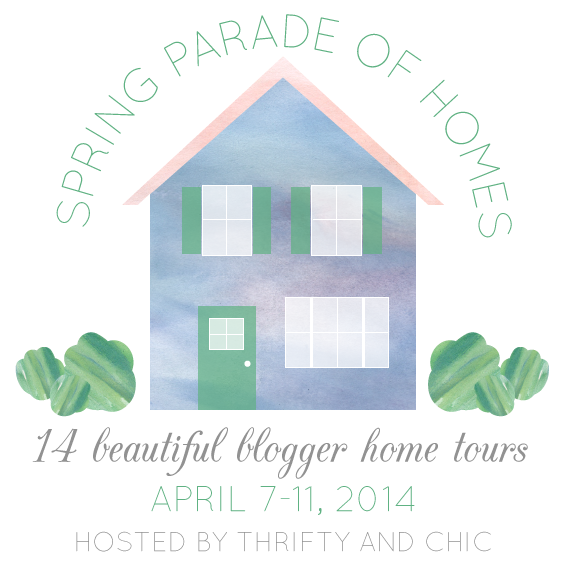 Catch a few beautiful home tours today! Oh man, this is too funny. We are moving to Jacksonville, Florida (in 25 days!) and have spent many, many hours searching for a place to call home. Your list is spot-on. We had great luck with Trulia and Zillow, if you're open to trying those out. I preferred Zillow, but then would search the address with Trulia because it gave crime ratings (near the bottom of the page, in a window w/ 4 other options), so we could see if the neighborhood was safe. Great post. There is some serious craziness out there on CL. I just had an episode this week, I can't talk about it or I'll get all upset again. WHAT?! I can't believe people actually posted that stuff. That is nuts! And how cool that you'll be in Philly! I'm in the other PA "P" city-- Pittsburgh! Good luck with the house hunt! Have a great weekend!